There are some of you who have forsaken the delights of alcohol in this Sober October. I'd be a Holy Souls man myself. The elders in the Catholic Church tell us, with some certainty, that a teetotal November secures remission for The Holy Souls from a place of incarceration known as Limbo, which is a kind of halfway house between Heaven and Hell. November, the month of the dead, is a type of off-season for drinkers. A month without hangovers does us no harm at all. Moderation in all things, except the rolling maul. Two days on the batter isn't good for the body or the mind. So it was with Munster at Thomond on Saturday. Yes, I know Munster beat Gloucester and picked up a bonus point, but Munster were sore going out on the field. Batter The hangover batter took place in Exeter last weekend. There was no standing back and the hits were ferocious. Exeter attack their opponents until they cry out for a white towel but Munster would not submit in what was a cage fight in Sandy Park. The week before there was another battering in the Aviva against Leinster. This game went off at Test match pace and there was let-up. The cumulative effect of those last two games gives us our diagnosis. Munster were hungover against Gloucester. I would suggest the PRO14 interpro should be played two weeks before Europe. Three tough games in a row is too hard on the players. The opinion polls had Munster well ahead and they may have been complacent. 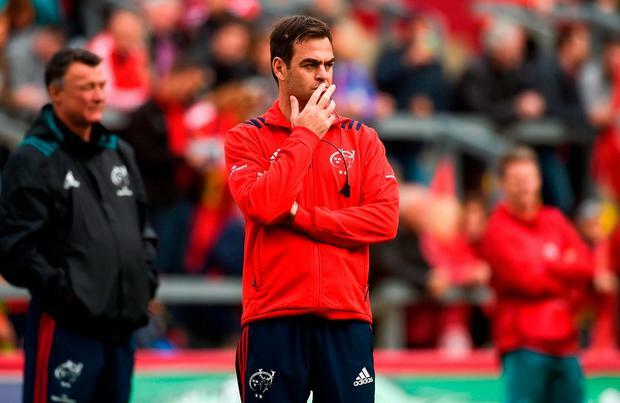 There was a mix-up at kick-off time and Munster played badly in the first 20 or so. Johann van Graan needs to work on the slow starts which have cost his team dearly in the past. Usually there is no sympathy for the hungover but this Munster ailment was more like a bout of morning sickness, the only positive sickness I know of. This massive effort was all about the birth of a team that is growing in stature with every passing game. I watched the replay of Saturday's game on the never-ending loop in Willie Sexton's Ardhu Bar. The Ardhu is usually packed after Munster matches, but the timing of the one o'clock kick-off is anti-social behaviour. European Rugby must be sponsoring Sober October. The big European days are a festival of Limerick. The city made this tournament. The Munster supporters brought the colour and the fervour. Limerick and the team deserve so much more than a slot in the undercard. Very few stayed around for the after-party. The ref did his best. The game took two hours. There were more rechecks than in the CAO. I was in the Ardhu minutes after Limerick won the best-ever All-Ireland Hurling Championship. You would think the fans would have gone mad after such a long wait and such a heroic performance from their team but the Limerick supporters were exhausted from the tension of it all. I think it's only now that Limerick is really enjoying the win. The swapping of flags usually signifies a change of regime. Joey Carbery has changed flags. He was excellent on Saturday. Brendan Kennelly was only a young fella when he sent some of his poems to Con Houlihan, the father of Irish sports writing. Con wrote back: "Keep going. You are making all the right mistakes." Last week Carbery kicked the ball too hard against Exeter and it went out on the full. This was the right tactic but Exeter went all the way to the Munster 22. The Chiefs knocked on when a try seemed likely. There was more to the knock-on than a mistake or a lucky break. Munster fought for Carbery. Lessons have been learned from the booing of Ian Keatley by some of the supporters. Joey, you will be well minded in your new home. Unlucky Danny Cipriani was a very unlucky ten in Thomond. Danny was given a red. The consensus in the Ardhu was he was badly wronged. I still think Munster would have secured the bonus point. Munster eased up before the end, or maybe they were just tired. That's the Champions Cup done with until December and the back-to-back games against Castres. By then everyone will be back on the beer for Christmas, which lasts 12 days all over the world but takes 30 in Ireland to make up for The Holy Souls. There's something about Munster this year. Van Graan and the IRFU made very shrewd signings. Tadhg Beirne would have had no bother at all in getting a place on Fionn MacCool's team. Carbery is classy, Mike Haley is a comet and Alby Mathewson must be kept on until the season is done. Start sparing up for Newcastle. Careful now. The Champions Cup final will not take place in the ever-friendly riverside town of Newcastle West. The final will be hosted by Newcastle-upon-Tyne in the merry month of May. Independent.ie Newsdesk Not for the first time, Munster fans are traveling in huge numbers for a European away-day.